Hey, Narelle, remember when you joked about all those oysters Akemi was getting me to eat and how I joked back that she was doing so in the hopes that I would eventually land the tainted one? 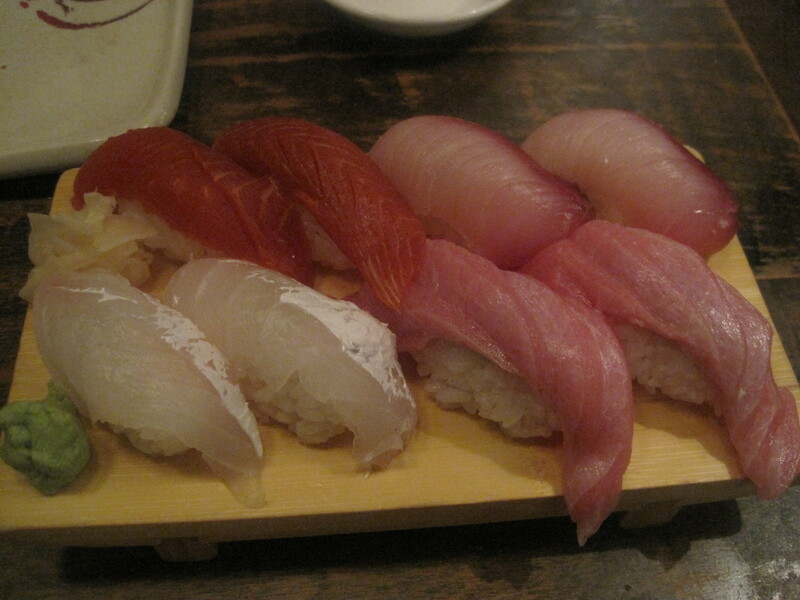 The first piece of toro imparted a very subtle flavor of spoilage. I skipped the second. Rather than wait for my Monday lunch with Denise, I decided to jump the gun and taste the mini doughnuts at that new burger place on 4th. I got two orders and ended up finishing my ten and Akemi’s five. I suppose it could have been worse. If the blueberry pie had been served with actual ice cream instead of the ill-advised mascarpone cheese that, unfortunately, tasted very much like cheese, it could have gone a whole lot worse. 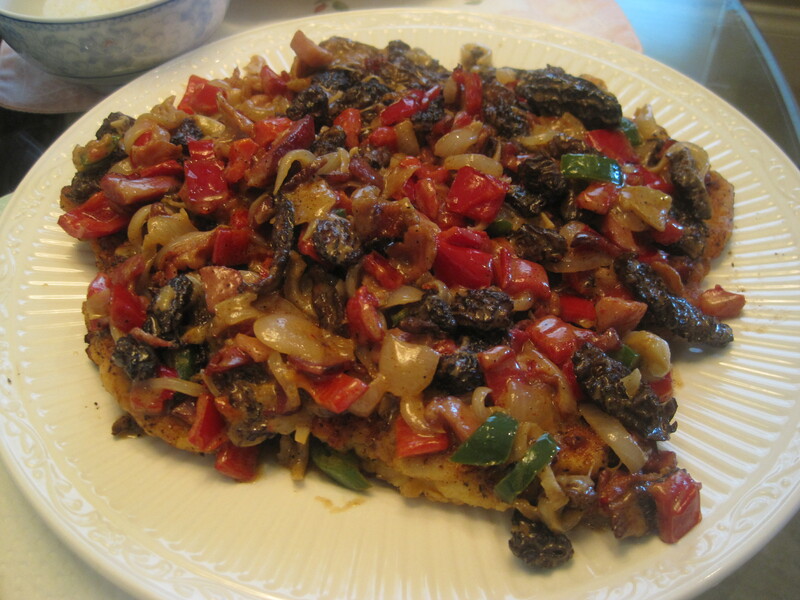 Pan-fried chicken cutlets with shallots, sweet red and jalapeno peppers, and morel mushrooms in a Metaxa cream reduction. “Cream” being the operative word – especially after sitting in the fridge for a couple of days. It’s always the one you least suspect – however, the last time I contracted food poisoning, I narrowed down the cause to the fresh sprouts I had with my sunchoke soup. Boy, wouldn’t this be ironic? In his book Kitchen Confidential Anthony Bourdain advises diners to skip the mussels, avoid ordering fish on a Monday, and never ever order the Hollandaise sauce. I chose to to follow his advice as regards the latter at breakfast yesterday. Serves me right? Ivon joined us for our second foray. 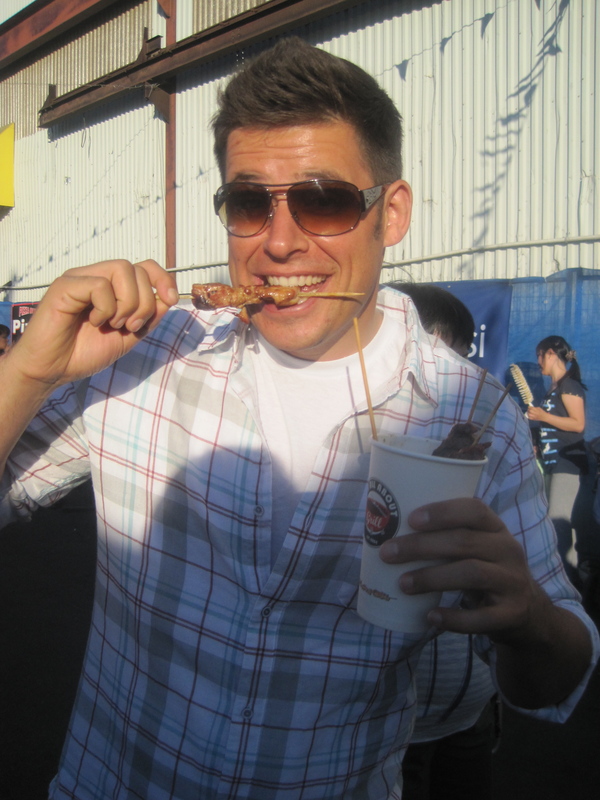 Clearly, the man loves his skewers. 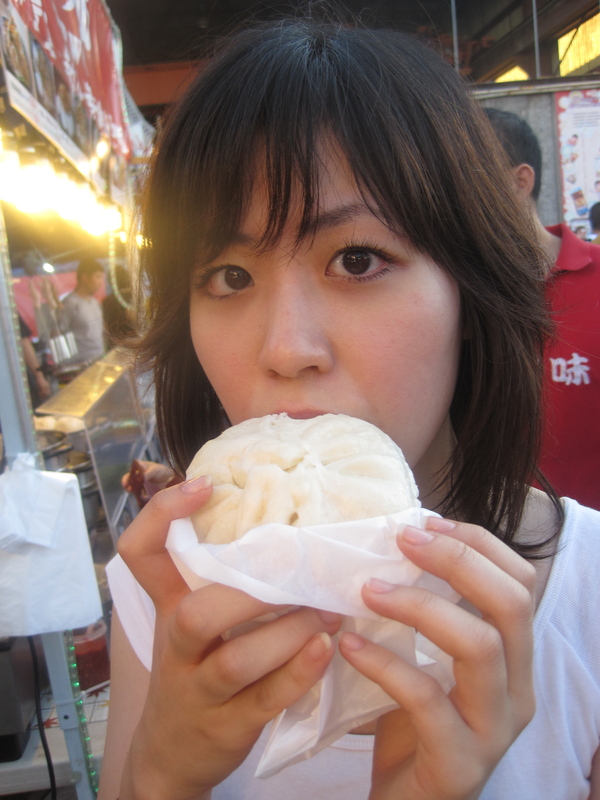 Akemi and her big pork bun. Hurricane Potato with ketchup. The breakfast of champions. On to the waffle balls: chocolate and the original no taste variety. 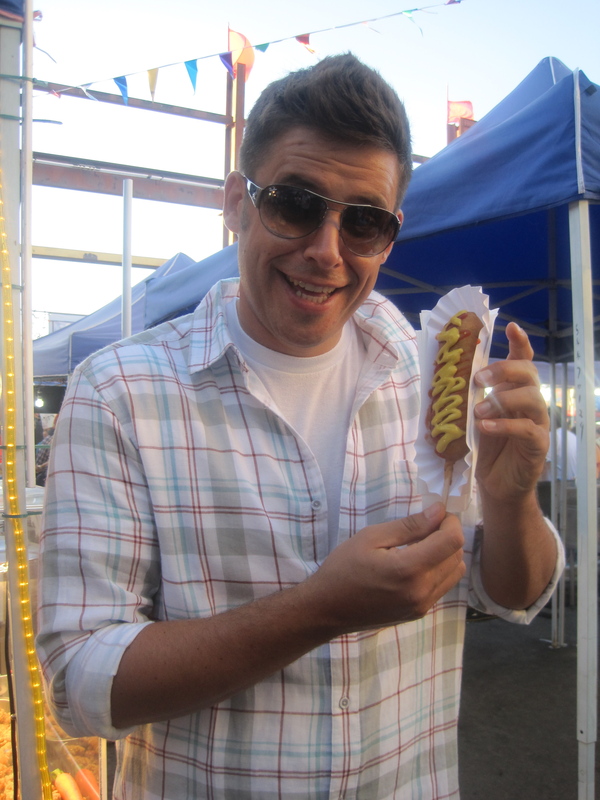 What better way to cap off the evening that with a corn dog? 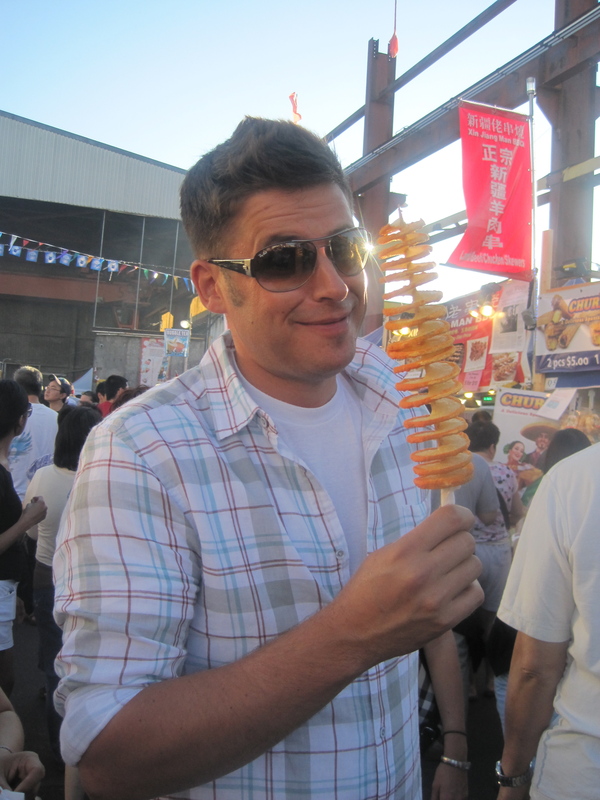 To be fair, I was feeling unwell heading into the night market so it probably didn’t cause the problem. On the other hand, it couldn’t have helped. The blame for my present condition no doubt lies with one of the above. Then again, like the passengers in Murder on the Orient Express, they could have all conspired against me. 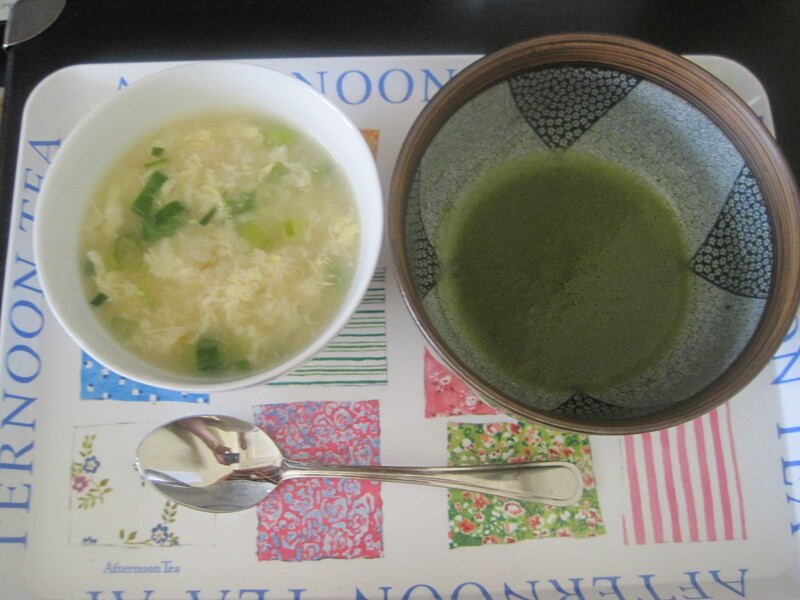 This is what you feed people in Japan when they're sick: rice soup and green tea. I’m on the mend. And good thing too. I have plans to check out a kobe foie gras burger tomorrow at lunch. Next Article July 26, 2010: Romer’s Burger Bar! Jelly vs. Lulu! Dance moves of the future! Sorry you weren’t feeling well, but glad you’re on the mend now. I always go through all the possible culprits myself when I get food poisoning. You should be able to figure out what caused it by the time frame between eating it and becoming ill – unless you ate that all within a short time frame, in which case, you wouldn’t need a pathogen to become ill from that much food. Sounds like, thankfully, you had a mild case of it. Glad to hear that you’re on the mend. The food always looks great and I would love to have your culinary adventures, but I don’t know where you put all that food… I think that I would be feeling unwell quite often. Enjoy it because you can, but be careful that it doesn’t catch up with you. In the meantime, bring it all on – I enjoy reading all about the food and people in your life! I got my money one the oysters or the sushi. Hopefully its the sushi though. 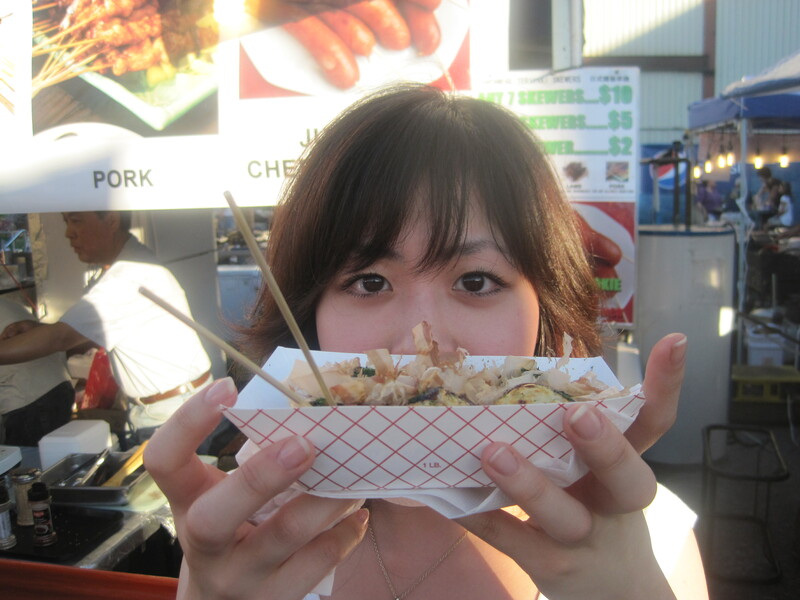 I know Akemi would feel bad if it was one of the oysters she encouraged you to eat. My sincere sympathies! Did the rice soup and green tea help? My usual go-to in such cases is Vernors Ginger Ale. I suppose any good ginger ale would help, but Vernors was what my mom gave me back in my childhood when I wasn’t feeling well and to this day there’s something comforting about the stuff. In fact, I’m having a bit now. Not sure if I ate something that disagreed with me, or I’m just having symptoms from a somewhat stressful week. Thanks for posting the link to that interview. The scene that Robert Picardo mentions in Broken Ties where Woolsey puts on his suit to relax was a favorite of mine, and marked the point where I began really liking the Woolsey character. Is that ‘homemade’ rice soup? It’s not Campbells, the green chunks are way to big for that. Ask Akemi what she puts in her rice soup. Hope you’re feeling better, Joe. I’d say the oysters!! 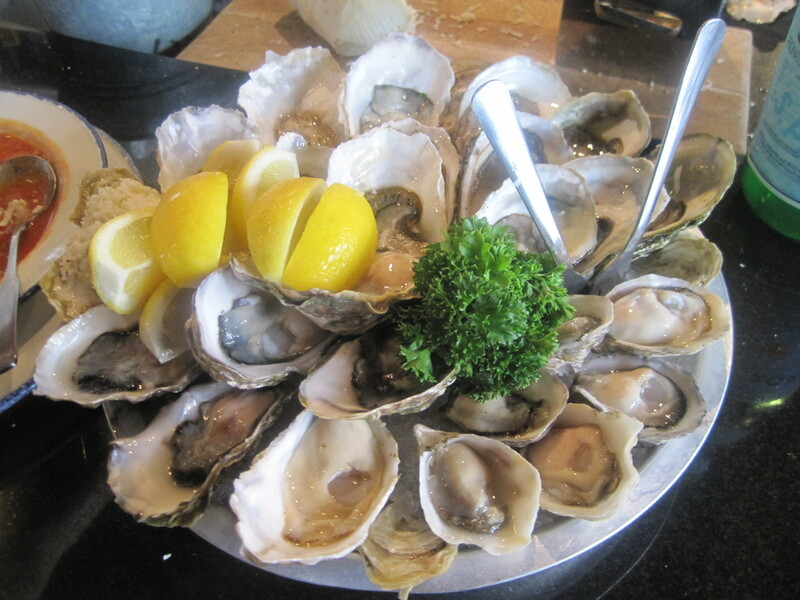 Did you ever read about Hester Blumenthal’s unfortunate oyster incident?? He notes this as his career low.. the oysters looked and smelled marvellous … but they were contaminated. All is ok now.. thank God. 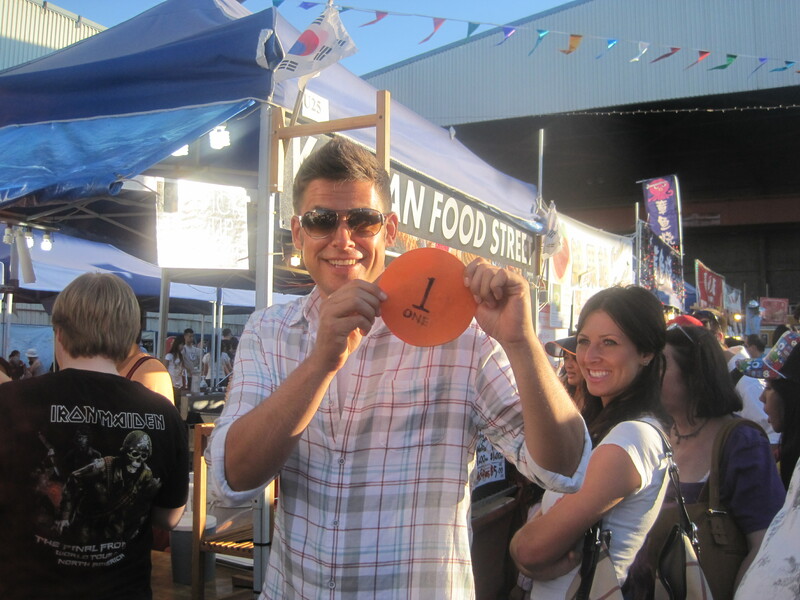 I love those night food markets.. wish we had one here in Perth. I enjoyed going to one in Chatswood, Sydney.. yum!!! Ah, Remnants. One of my favourite episodes as well! Also the name of most of my fantasy sports teams -coincidence as I’ve used the name for 14 years! Geez, I hope the E. coli runs its course quickly. Feel better soon! well, that addressed any questions I had about what you’ve been eating lately. Given your expansive range of food tastes, I would shudder to try and decide which substance mght have done you in. Unless you hear reports of dozens of people going to Hospital with similiar symptoms, and you see the name of one of the eateries on the television. Glad to see it’s not slowing you down. After all. it’s Sunday evening now, and you still have writing to do tomorrow. Thanks for the post, pics, and Picardo, and I hope you bounce back quickly. Joe, how do you eat so much and still maintain your weight?? ?How many doughnuts? Mini or not. It’s no wonder your solar plexus hurts. But it looks like Akemi has things under control for ya. If she tried to poison you, she wouldn’t be trying to make you feel better. I had a really good question, but for the life of me I can’t remember what the heck it was. It’s a white blonde moment. (white blonde = grey=senior moment). Tried new migraine medication today, Treximet – wow it worked. Took away the pain and my memory. ok reading backwards, “Peanut Butter and Jelly”- cute and very creative, didn’t have time to write huh? Cool, idea post videos of Jelly, those were soooooooooooooo cute. 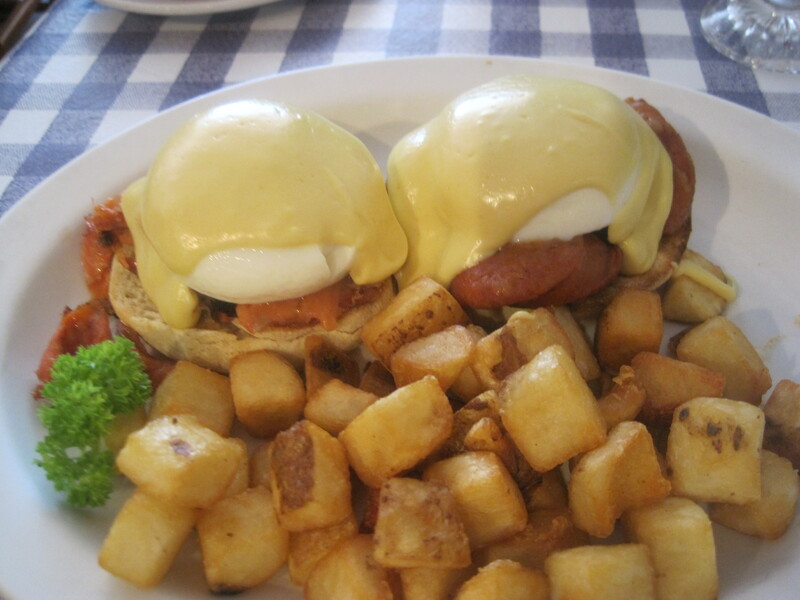 Do you suppose not one, but ALL of the above contributed to your gastronomical downfall? Mind the tummy and feel better. Was I being terribly mean because I laughed when you said you had food poisoning? I’m going to eat now (again). THANKS!! What’s making you sick? I vote for all of the above, excluding, of course, the foods that usually don’t cause illness or death (just fatness) – mini doughnuts and corn dogs. Akemi is a wise woman: tea and rice are excellent for upset tummies. And whatever you ate 18 to 24 hours prior to you problem is the most likely culprit, though spoiled rice (bacillus cereus) can attack in 6 to 8 hours. I hope you feel better soon, though I can’t help mentioning that a foie gras kobe burger sounds like a bad idea considering your delicate condition. Awwww….sorry to hear you’re feeling a bit under the weather. Serves you right for not sending me that chocolately thingy! If it makes you feel any better, Mr. Das had a touch of ‘something’ last weekend. He wasn’t sure if it was the quick turkey sandwich he grabbed at the local WaWa late Friday night, or the stuffed French toast for breakfast at the dinner Saturday morning. We know it had to be one of those two things because Saturday morning he started with pains and tummy rumblings, even though it didn’t hit him fully until Sunday afternoon. Took a while to incubate, I suppose. Or, maybe he just had an intestinal bug…but it kept him in bed Sunday night and all day Monday. Here, Joe…something to cheer you up. We went to a family backyard BBQ tonight, and spent some time with Mishu, a 17-year old lady pug. Warms your heart, doesn’t it? Feel better, Joe. Sleep well. I meant diner, not dinner. i’m not sure if any one of those things has made you sick, my money is on all of them. Gotta agree with archersangel.. you do eat some weird arsed stuff. why did you choose a blog instead of a live journal? i’m asking, b/c i’m seriously considering joining one of them, and i’m leaning towards blog. i’d choose a wordpress blog, so: why did you chose it instead of live journal, and what are the perks of a wordpress blog? Ahhh the Richmond Nite Market! Glad U suggested that place! Got to check it out a week ago this past Friday. Loved the Hurricane potato fries! I got Sour Cream flavoring on mine! Also tried these veggie roles though I don’t know if I fancied them as much as I thought I would. But they were still alright. Absolutely loved the market! Never got to see sooo much food in one place! 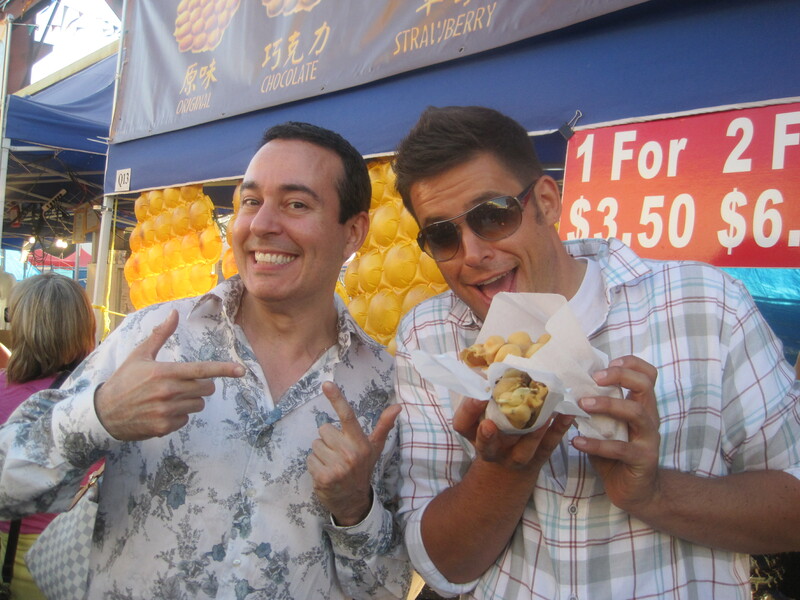 I was definately in my happy place with all that food! After hearing that some SGA cast will appear on SGU, any chances of some SG1 cast making any appearances also in S2 SGU? Do the SGU cast like recieving fan mail? Did I miss that Akemi is staying with you again? What happened to her travels? So you are seeing Denise again so that means she is back from NY wasn’t it? Busy boy. Sorry to hear about the poisoning Joe. I’d put my money on either the oysters or the sushi. 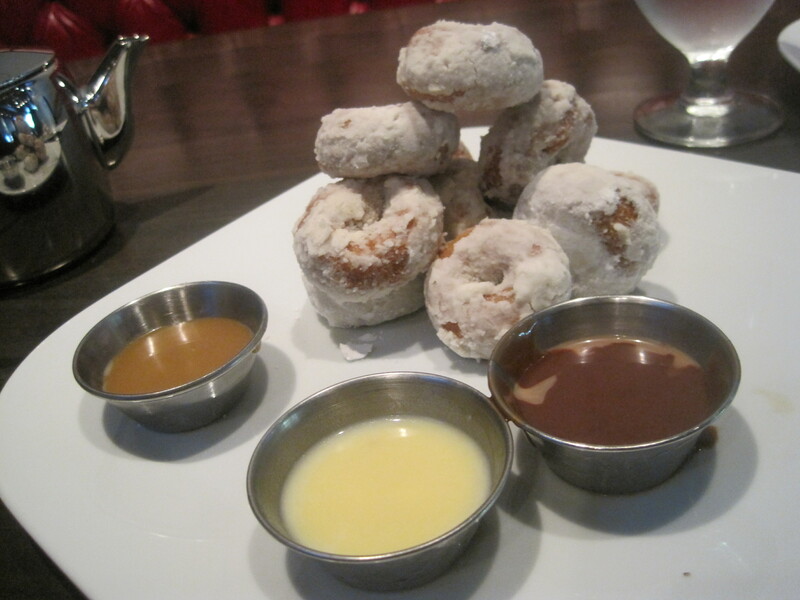 Mini doghnuts are too innocent to be the culprit! Someone mentioned “Broken Ties”. That too was a pivitol SGA episode for me in that was when I began to like Woolsey too! Before that I was not sold on him being on Atlantis. But that episode and beyond, I began to actually warm up to him on the show. So it will be exciting to see what happens in S2 of SGU with the knowledge of some SGA cast making appearances!